Staples will forever be my hero for providing teaming up with Martha Stewart to create these cute blue sleeves. 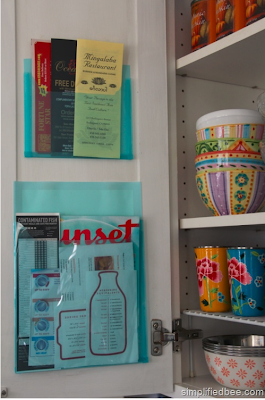 Just use some double stick tape on the inside of your cabinet, and OMG, you have a nice organized, easily accessible paper holder that takes up almost no room at all! Especially in the kitchen with all the loose menus that I insist on keeping (but never use because SeamlessWeb is just so much easier to order from) will now be all cleaned up and clutter free!